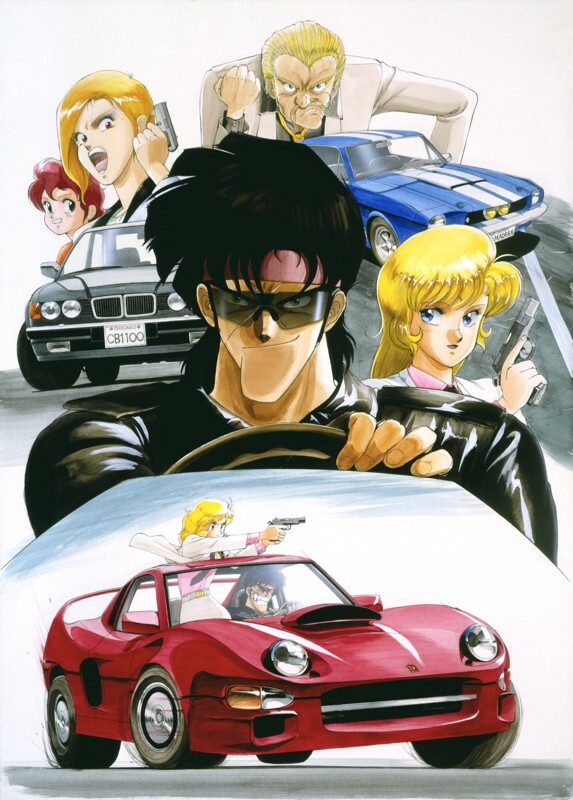 On each of our Anime crowdfunding projects, I like to do interesting and unusual things. 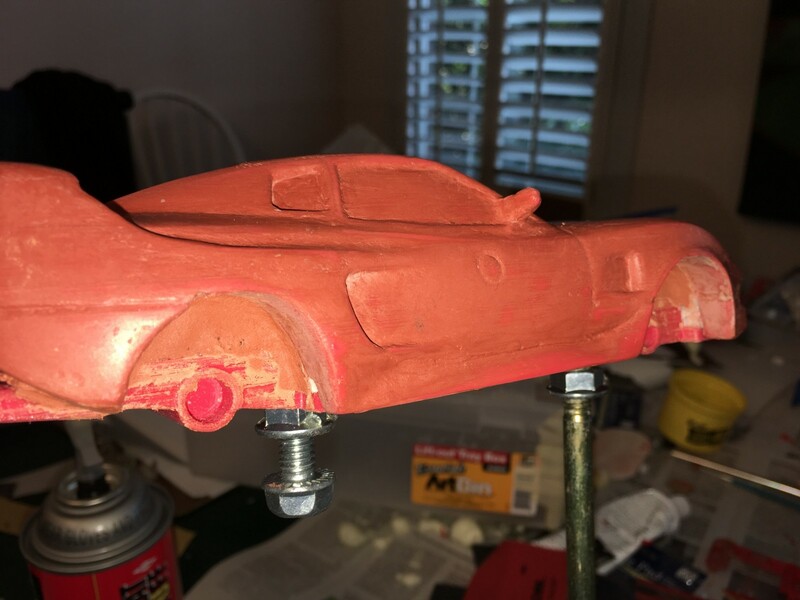 For the Riding Bean project, since one of the main characters is arguably an awesome car, I decided to make a scale model of Buff the Roadbuster for the backers who pledged at the Nitrous-Injected level. 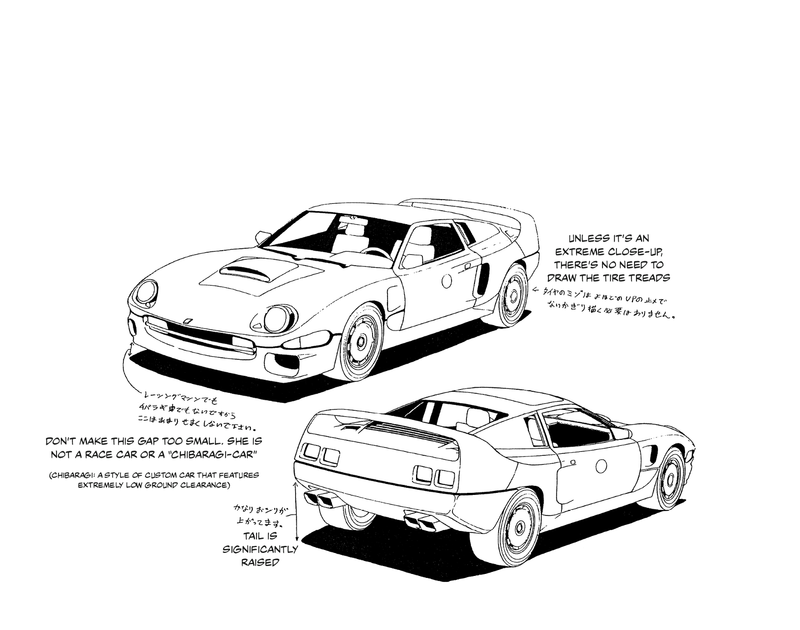 Natsumi and I engaged a well-known Japanese garage-kit sculptor, Yoshiyama Haruki, to make us a model of Buff, working from the original design drawings as well as feedback from the creator of Riding Bean, Sonoda Ken’ichi. The end-result was a 1:64 scale model of Buff, which was the starting point for all the delightful insanity that ensued. …and sent of to the pros at On-The-Lamb for casting. 1:43? Didn’t the headline say 1:24? Indeed it did, astute reader. 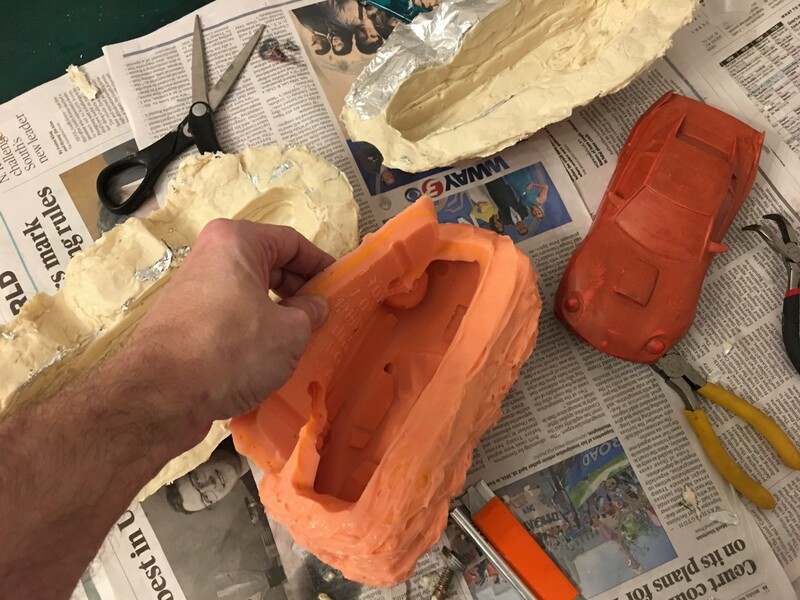 All of this digital and physical modeling had piqued my interest in the whole process of making molds and castings, something I had never done but that related to my family history — my father was a chemist who specialized in resin-coated sand, which is used to make molds for metal casting. So I decided to make a big Buff. I’ve had an Ultimaker 3D printer for several years, and it’s a lot of fun. 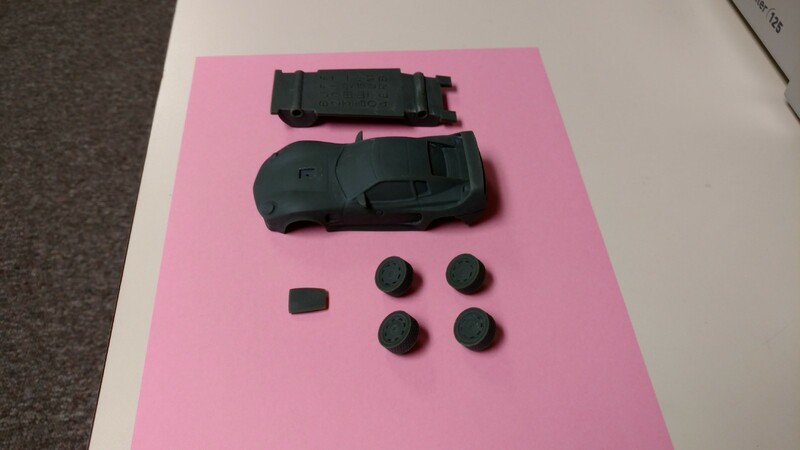 So the first step was to print out the parts in 1:24 scale. 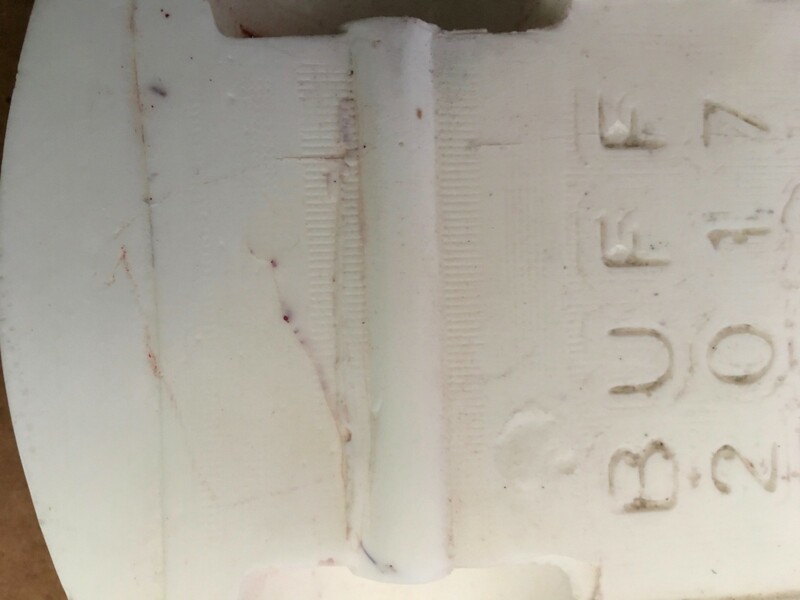 As it happens, in 1:24 scale, the main body of Buff just barely fits on the Ultimaker stage — with only a few millimeters to spare! But only if you print it diagonally! 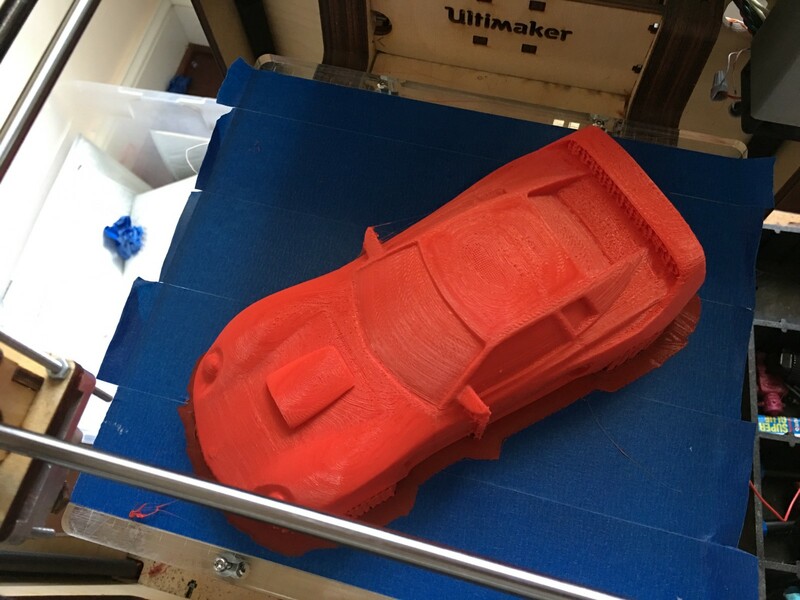 This was a 40-hour print! 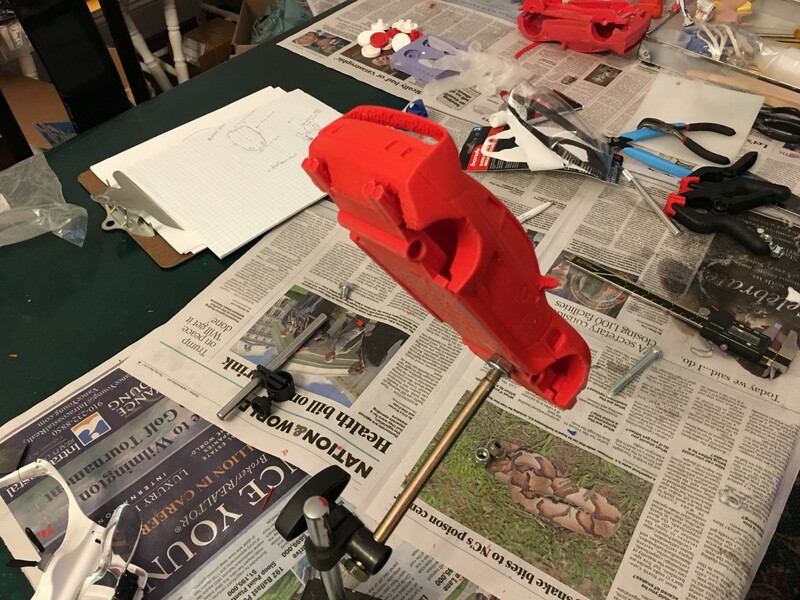 At this point I hadn’t decided on whether I was going to mold and cast the main body as a single part or as a separate body and chassis. 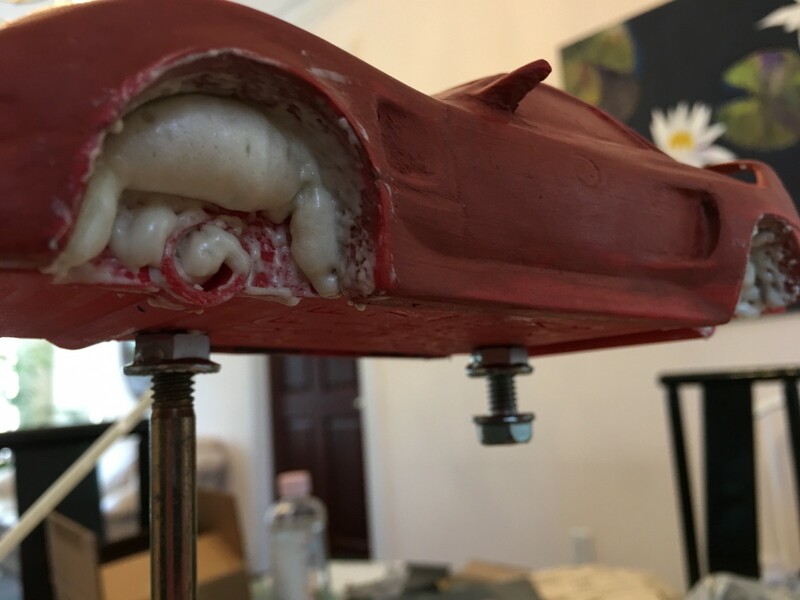 If the latter, then I would want the body part to be as thin as possible to save on casting resin, but just scaling up the original part would make it thicker. So I used some free 3D modeling tools (Meshmixer and Netfabb Basic) to cut away the inside of the body and then recreate the shell with the proper thickness. 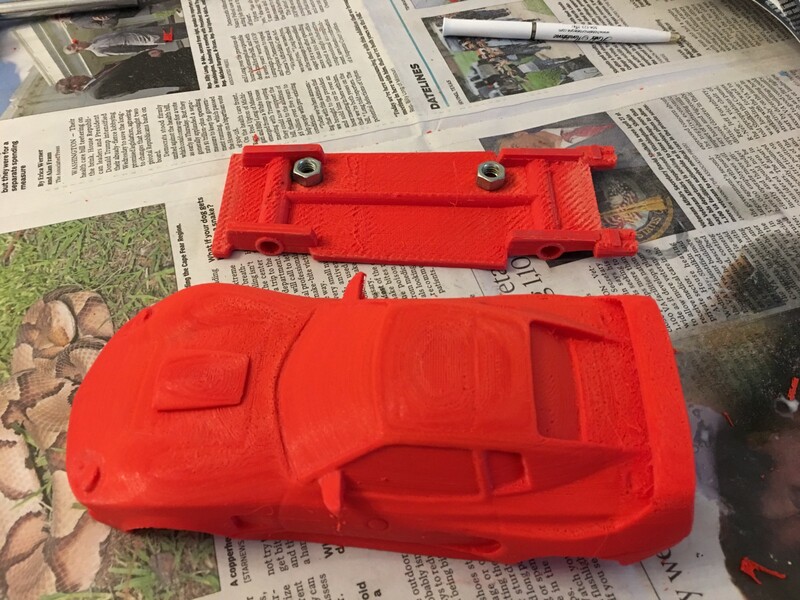 By the time the body print had completed, I decided I’d combine the body and chassis and make a rotacast. 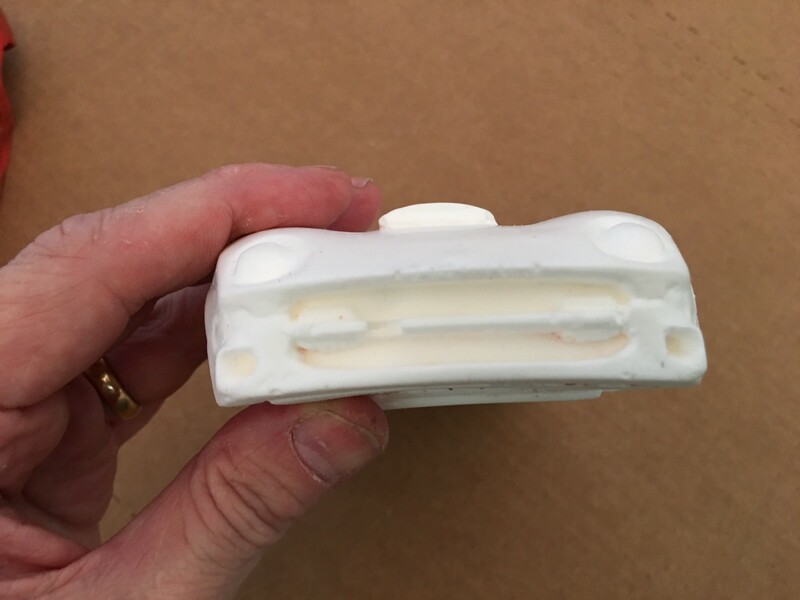 This involves making a hollow mold cavity, adding the casting plastic, and then rotating and tumbling the mold while the plastic cures to evenly coat the interior, resulting in a hollow shell — again, saving on casting resin. …and drilled some access holes. These would also give me a way of getting the resin into the eventual mold. 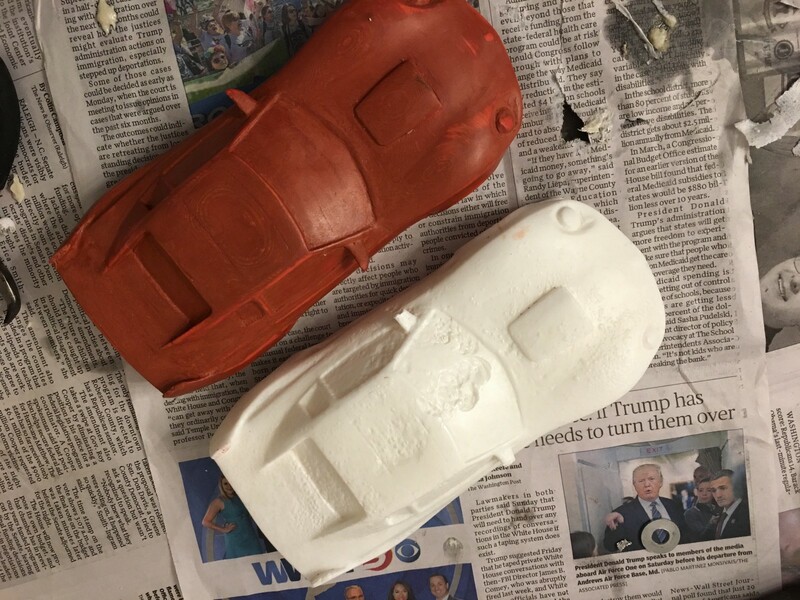 …and then sculpted the wheel-wells with air-dry clay. 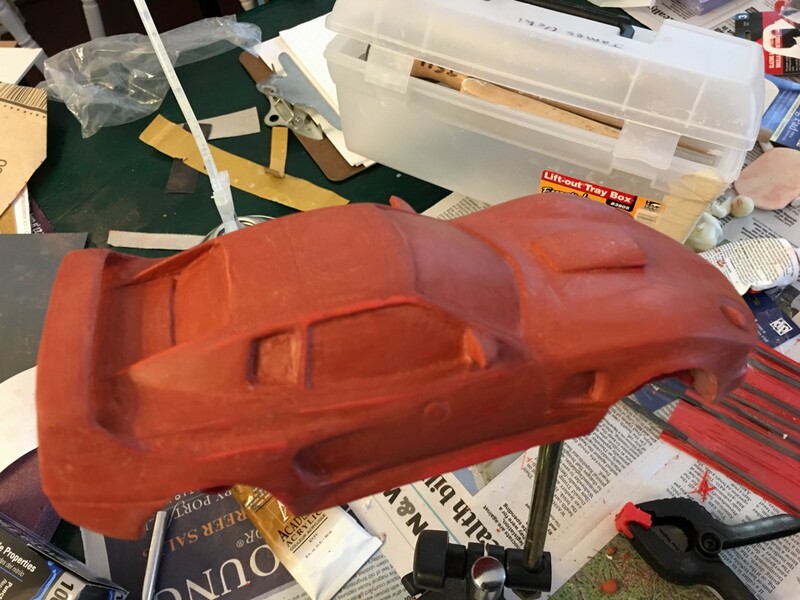 …and then adding some more Bondo and doing some more sanding. Basically, every time I took a break from Real Work, I’d sand the damn model for 10–15 minutes. I think it took 4–5 days of several hours a day, but thankfully I have little memory of this time. 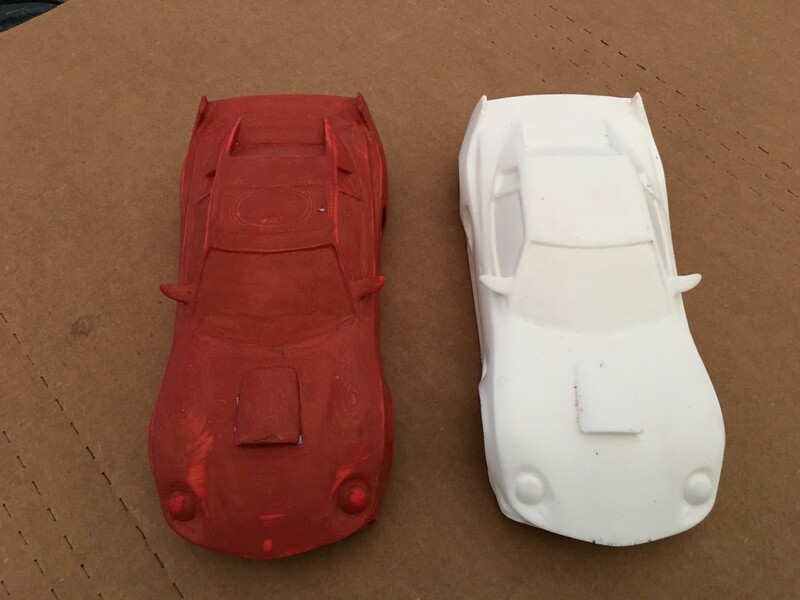 One issue I had to address was the geometry of the model, in particular the rear spoiler, which forms a loop. 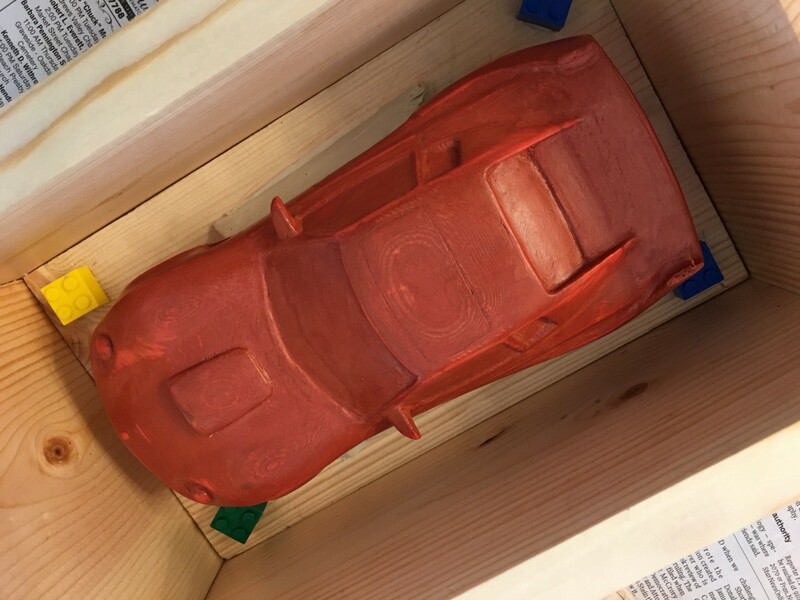 This makes the car topologically equivalent to a donut, which means that the model would get locked into the mold unless the mold was cut in a line that goes through the spoiler (thus breaking the loop). I wanted any mold lines to be hidden on the bottom of the chassis, so I had to eliminate the loop. 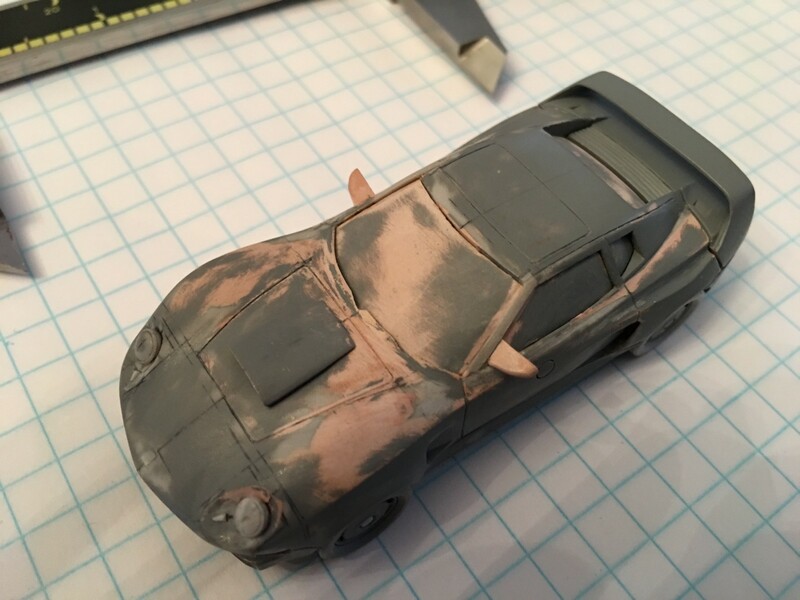 There were two ways to do this: break the model into two parts (the top of the spoiler and everything else), or put a barrier inside the spoiler so the loop wasn’t connected (which would require a little cleanup on each casting to restore the loop). 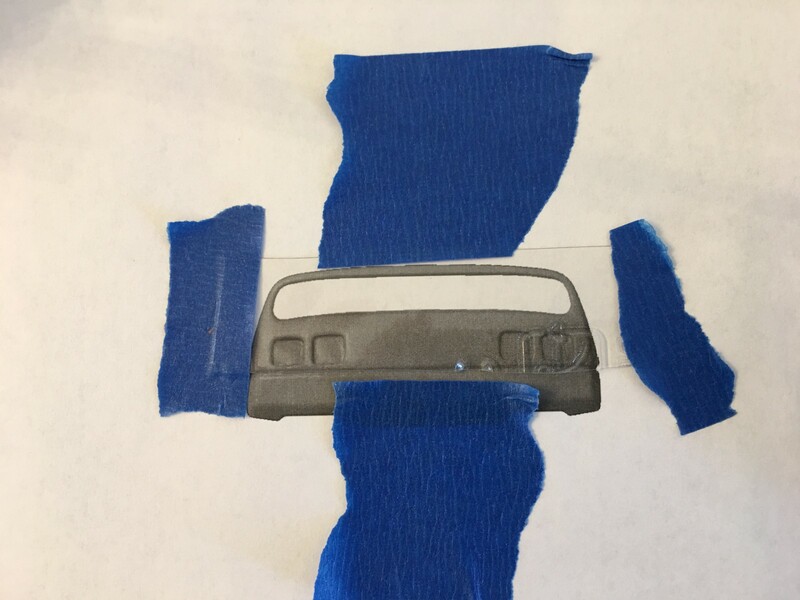 I decided to try the latter approach, and so I created a custom gasket to fit inside the spoiler. 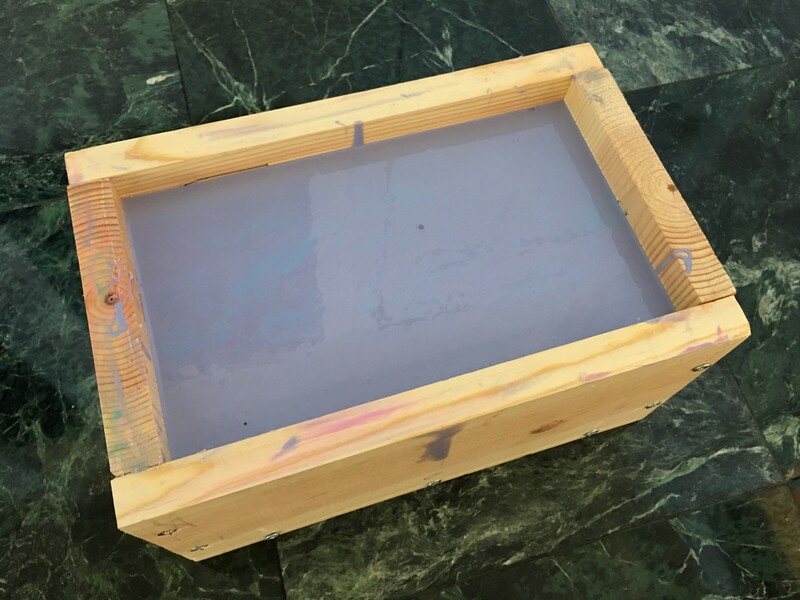 …and then I laid down a coat of silicone rubber on some foamcore, let it cure, put the plastic cutouts (I made 2 in slightly different sizes) on top of it, and brushed on another thin layer of silicone, encapsulating the cutouts. The result was a custom gasket that I could push into the spoiler to seal it and break the loop. 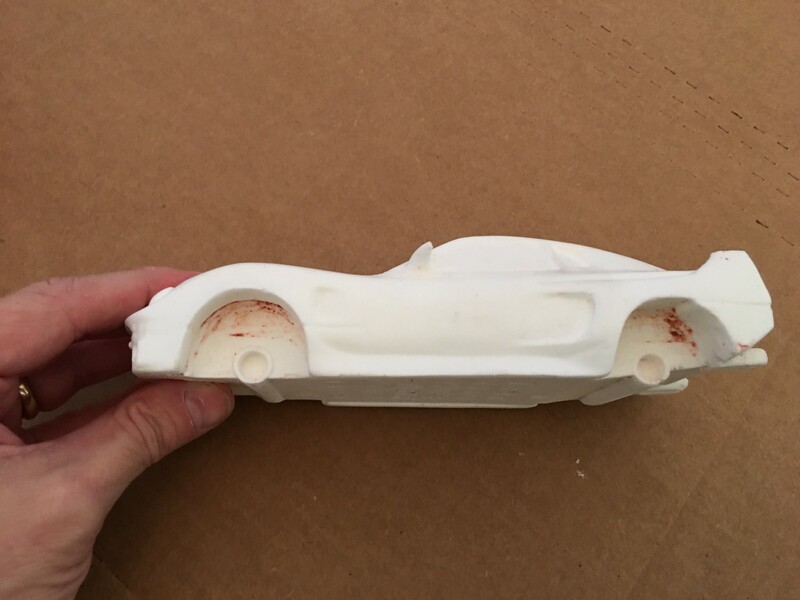 Unfortunately, when I inserted the gasket, the extra pressure it put on the spoiler cracked it at the weakest point (the vertical section) and pretty cleanly separated the top of the spoiler from the main body! 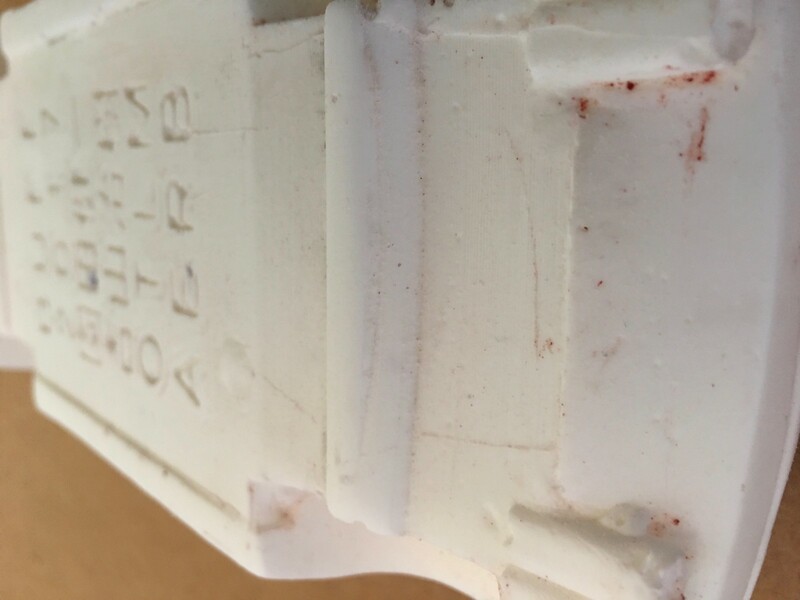 This was because thin 3D prints are weak vertically — the layers can separate. 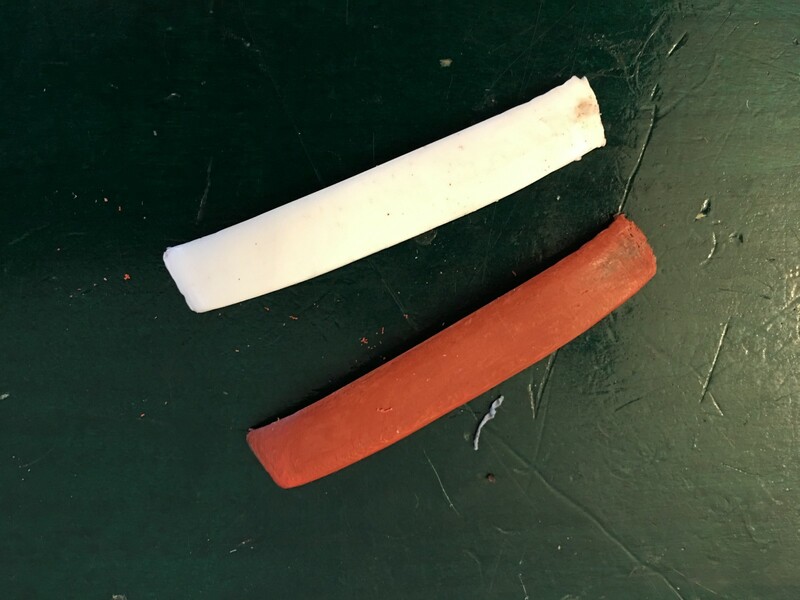 …and did a test casting. Problem solved. 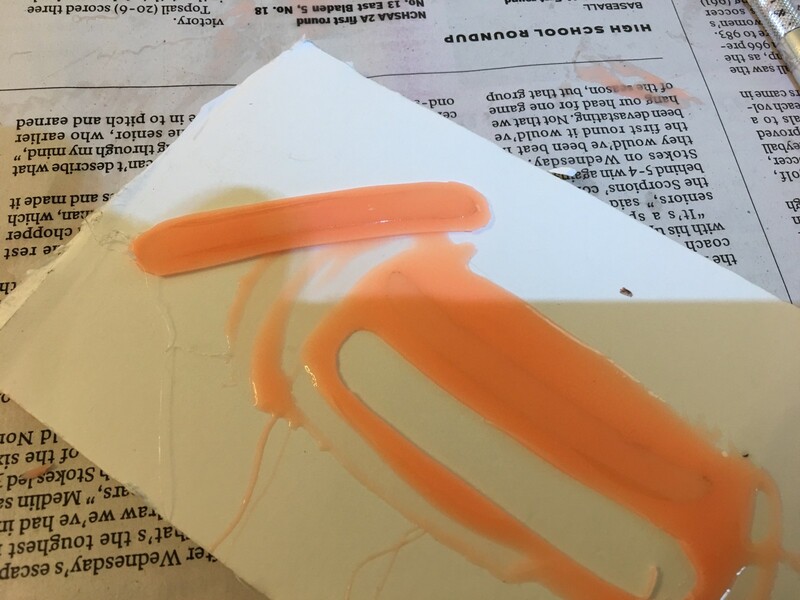 At this point I should mention that I was using Smooth-on molding supplies. They have a ton of products for molding and casting, and several handy starter kits. They also have a ton of instructional videos on YouTube that are very helpful. 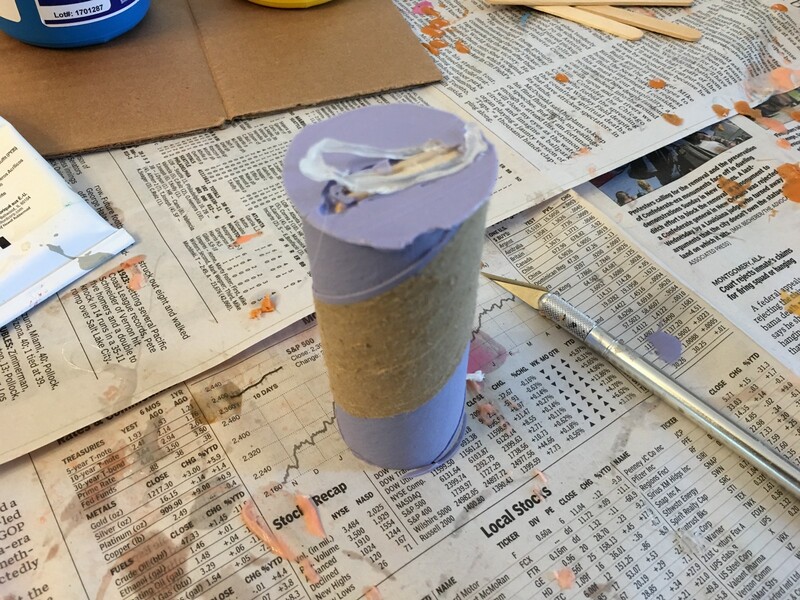 …and then I prepped and made the support shell. Finally, I separated the parts, cut the mold (on the bottom on a bevel, to hide any resulting mold marks), and removed the model. Now it was time for a test casting. 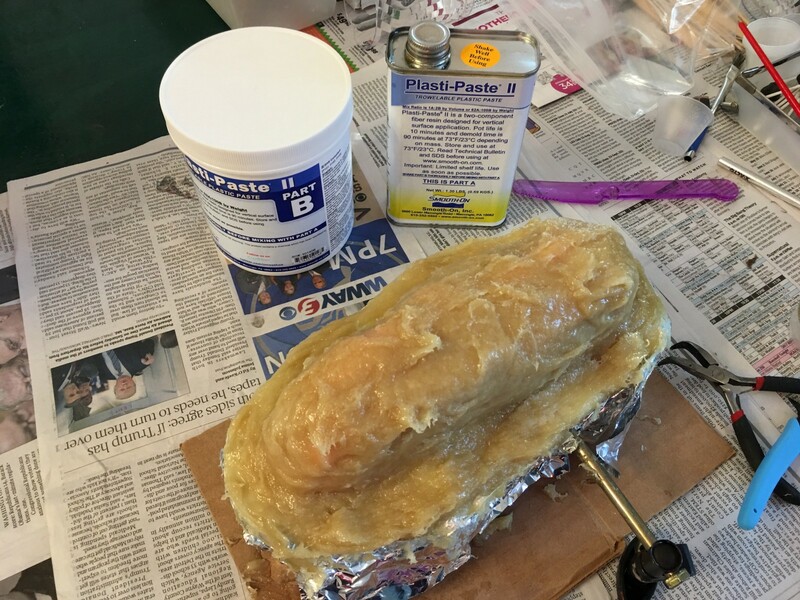 For a rotacast, you want to use a resin that cures slowly, to give time for it to get into all the nooks and crannies of your mold. 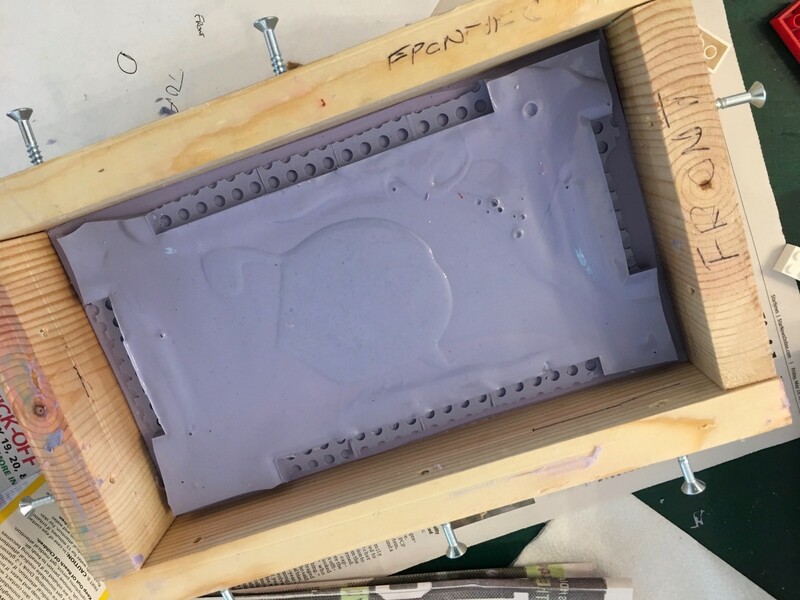 Smooth-on recommends using Smooth-Cast 65D, but I only had some Smooth-Cast 300, which is a snap-cure resin — once it reaches the end of its pot life, it goes from liquid to solid in just a few seconds. But since the 65D was one AmazonPrime away (a quantum unit of spacetime that has a high probability of collapsing to 2 days), I decided to give it a test with the 300. Not bad for a first test, but there were some issues. First, I’d washed the mold but apparently didn’t let it try enough, so the plastic couldn’t get to some areas. 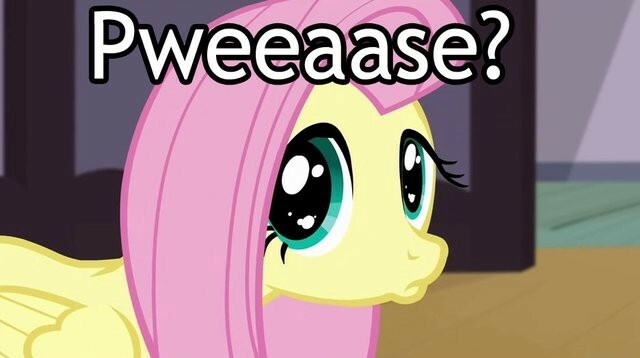 Also, the snap cure caused some surface imperfections. However, the biggest issue (which isn’t visible in the photo above) was that the entire casting had a very slight twist to it. I think this means that my support shell wasn’t doing a good enough job, or perhaps the mold wasn’t seating into the shell properly. Whatever the reason, it wasn’t acceptable. 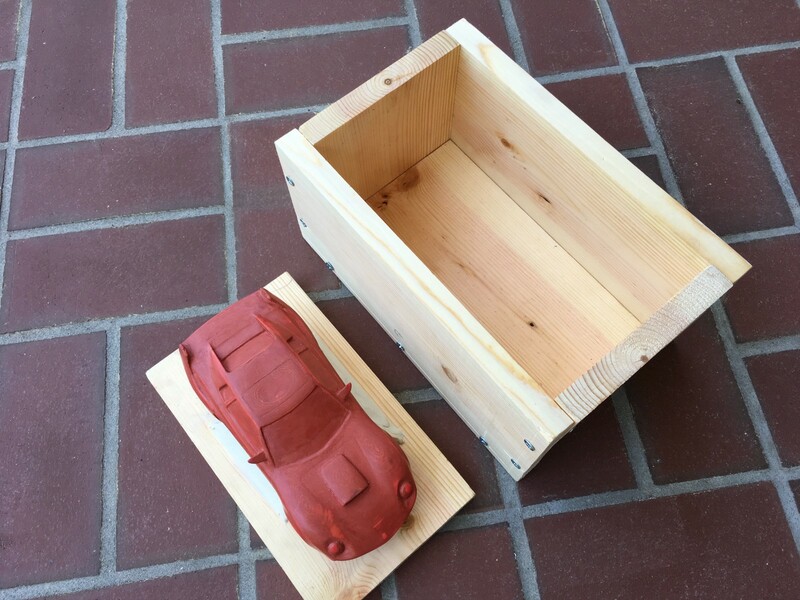 So while the 65D was en-route, I decided to try another approach— a simple box mold. 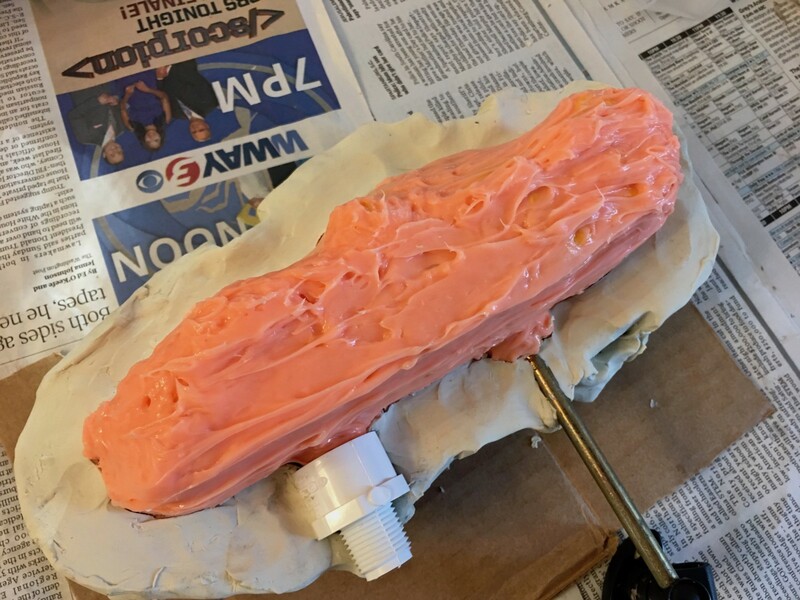 This would require more silicone than a brush-on mold, but would be simpler and hopefully harder for me to screw up. I got some 6x1 board from Lowes and quickly constructed a solid box. 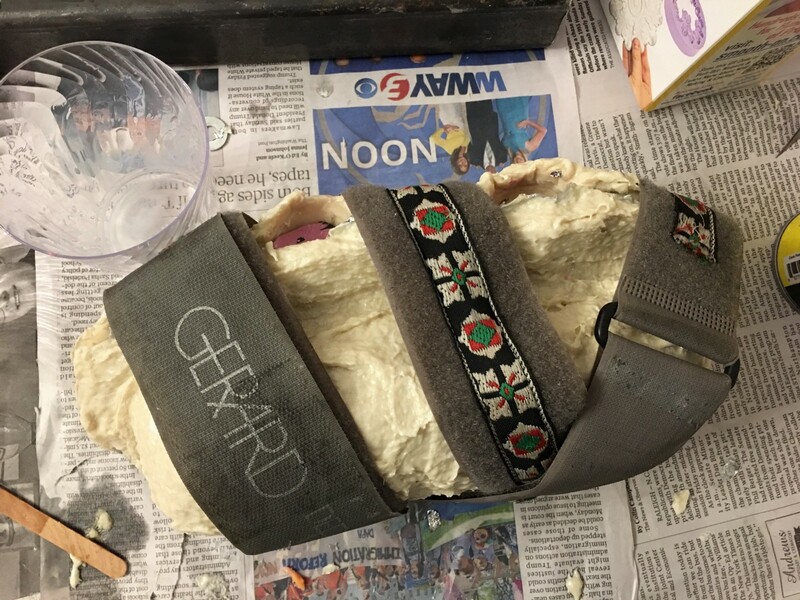 In addition, I made a base plate (the same size as the box bottom) and attached the model to the plate using a trapezoidal prism of non-sulfurous sculpting clay (sulfur inhibits the silicone curing process). Everything was sealed using Super-Seal and then sprayed with Ease Release 200. 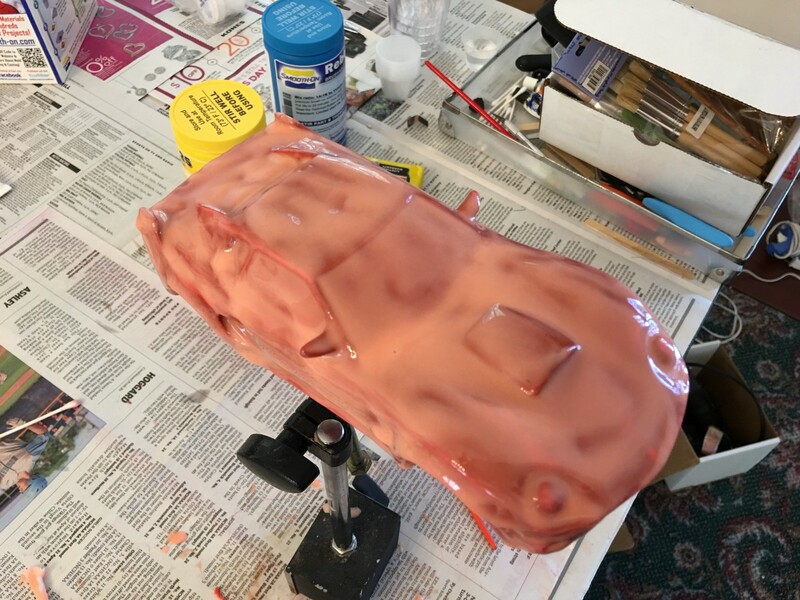 …and then OOMOO 30 silicone is poured on top of it. Oh damn, ran out of OOMOO goo! 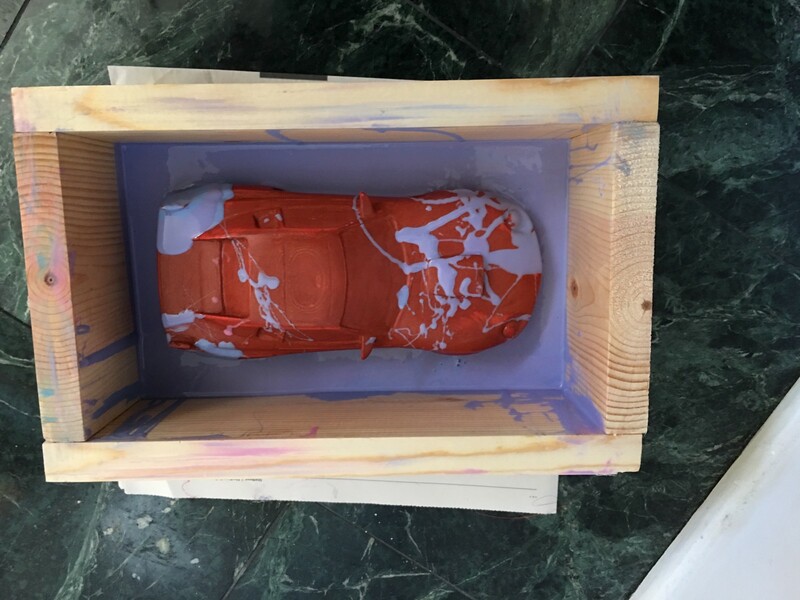 As I was saying, OOMOO 30 is poured on top of it (unless you use mold release, it will stick to itself, even after its cured). 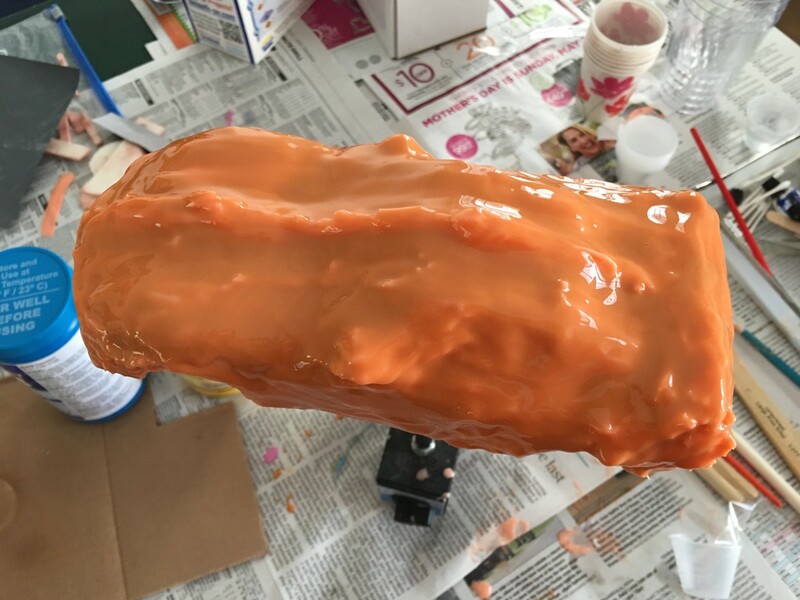 The result is the first half of our mold. 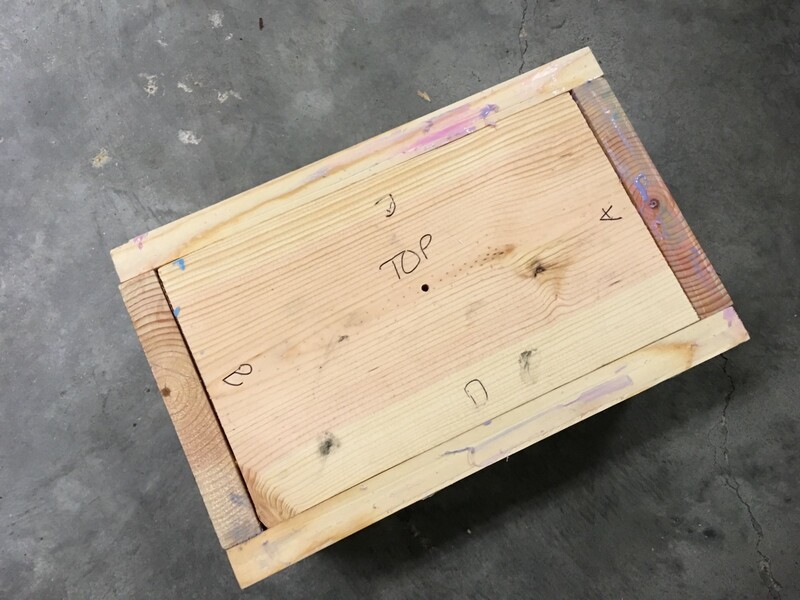 After the silicone cured, I dropped the top of the box mold into the box so it rested firmly on the silicone rubber, marked the location, drilled a few screw holes, and firmly attached the top. 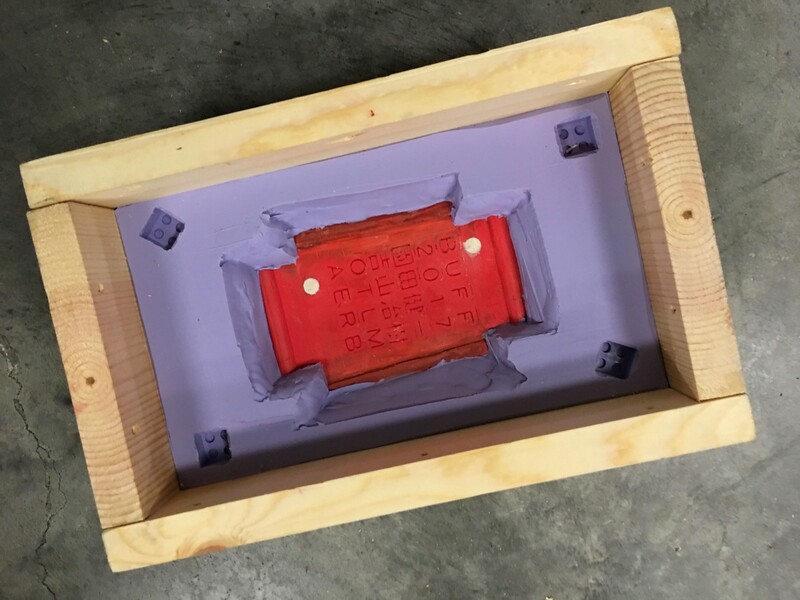 When the box is turned upside down, the newly attached top now supports the silicone. 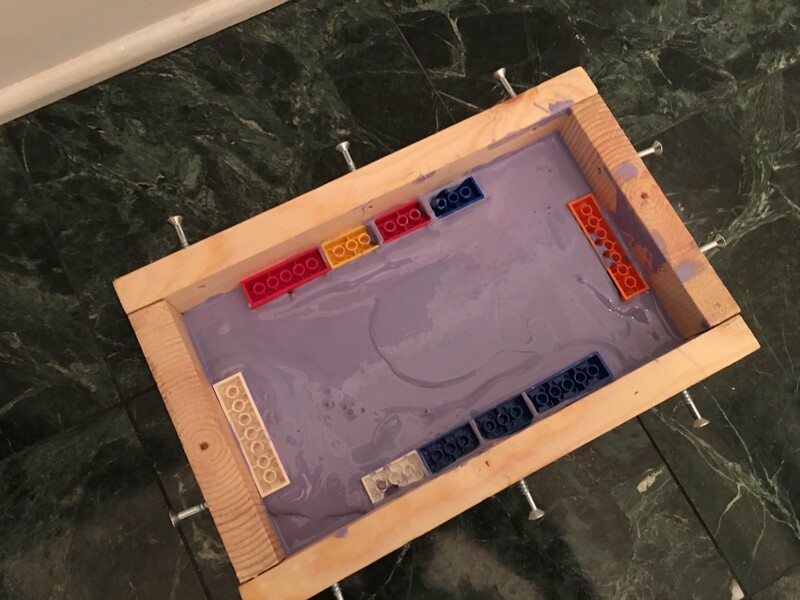 I then removed a side and the bottom, which let me extract the base plate, clay, and legos, exposing the bottom of the model. 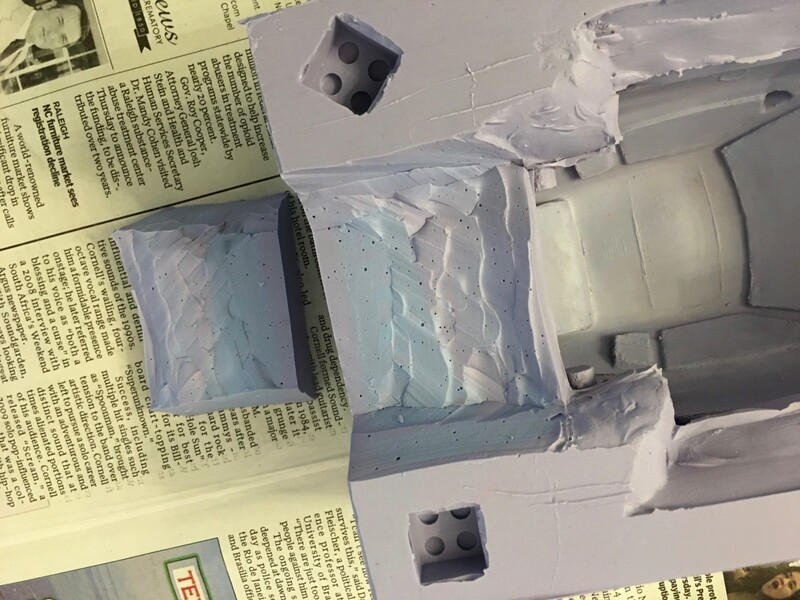 The next step is to cast the second half of the mold. 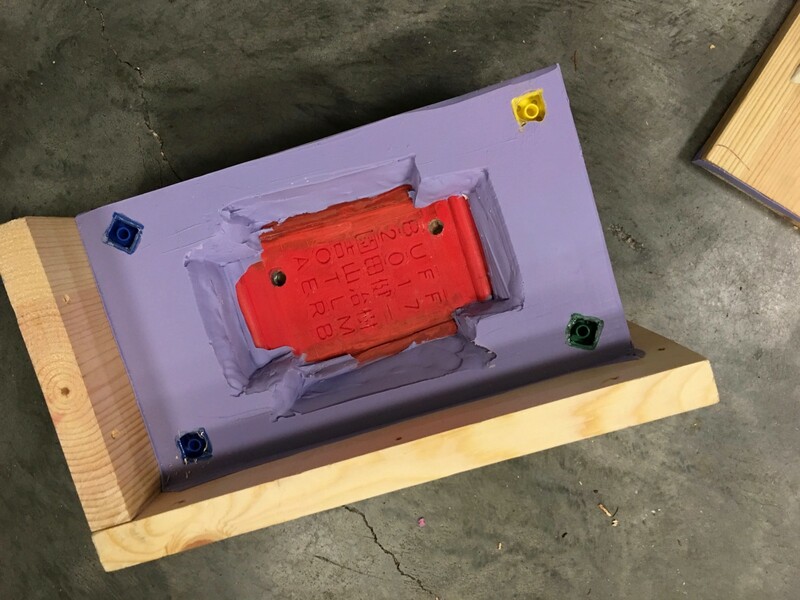 Note how the trapezoidal prism shape and lego keys are going to allow us to precisely reassemble the mold halves, and the prism will support the part of the mold that contains all the chassis details. 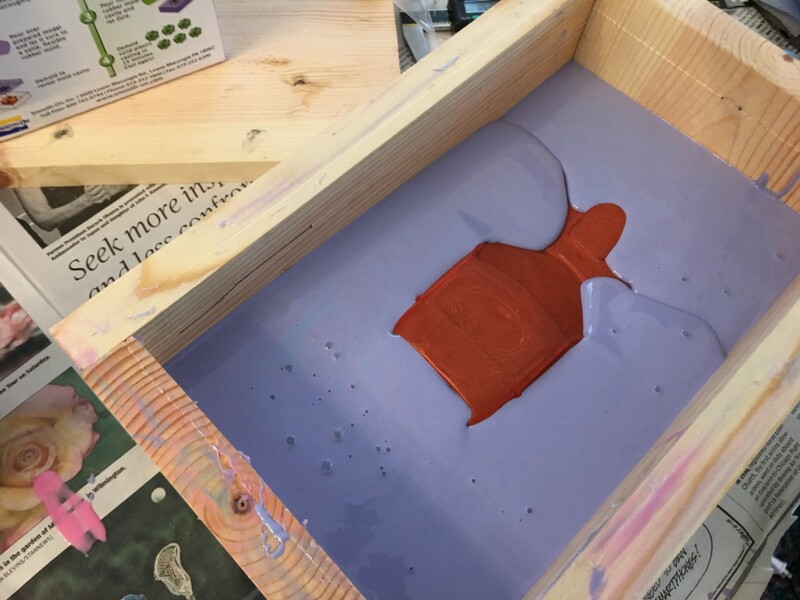 I filled in the bolt holes with some clay, sealed them, and then applied Ease Release 200 to all surfaces; this prevents the new silicone from sticking to the first half of the mold. …and the resulting space is filled with more OOMOO 30. And damn if I didn’t run out again! However, I had enough left to completely cover the model; I just didn’t have enough to fill up the box to where I’d like it to be. I popped in some legos to take up some space, and I’ll try using some other filler material as support. Worst case, I can just get some more OOMOO and add to the mold. 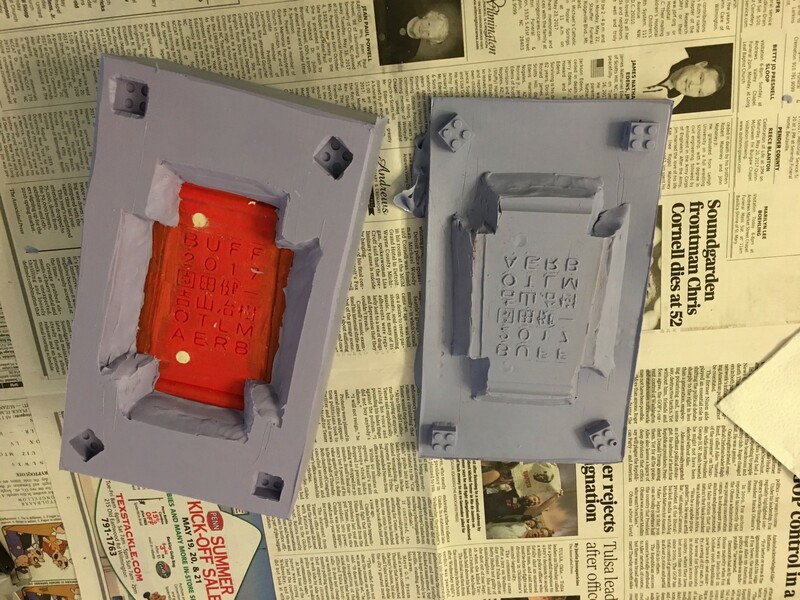 After it cured, the box was disassembled, the model removed, and now we have our two mold halves! Also, while it wasn’t a big issue, my lego keys were rotationally symmetric; only one of them should have been in the “diamond” orientation. 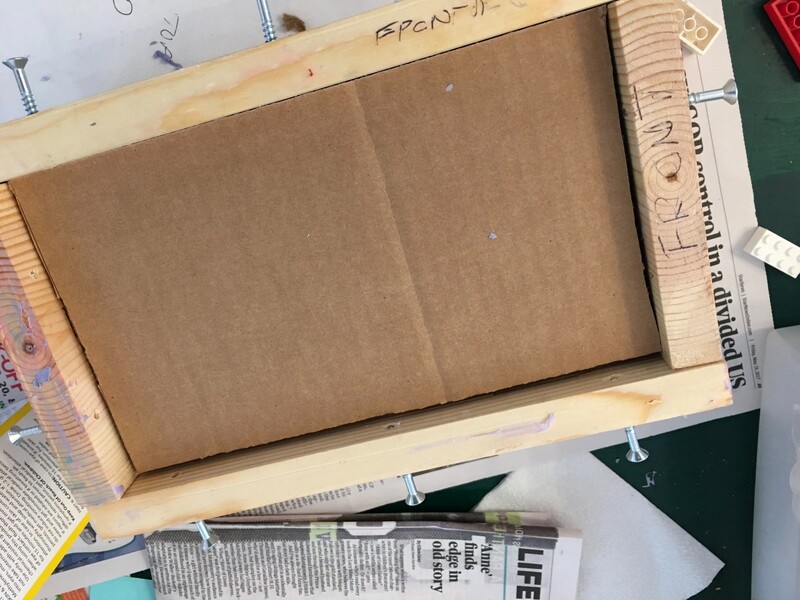 I also trimmed a bit of the edge of the bottom mold so that I could easily combine the two molds while the top mold was already in the box, and I did a test fit and found that 3 layers of cardboard nicely filled the gap between the bottom mold and the bottom of the box. Now we make a casting. 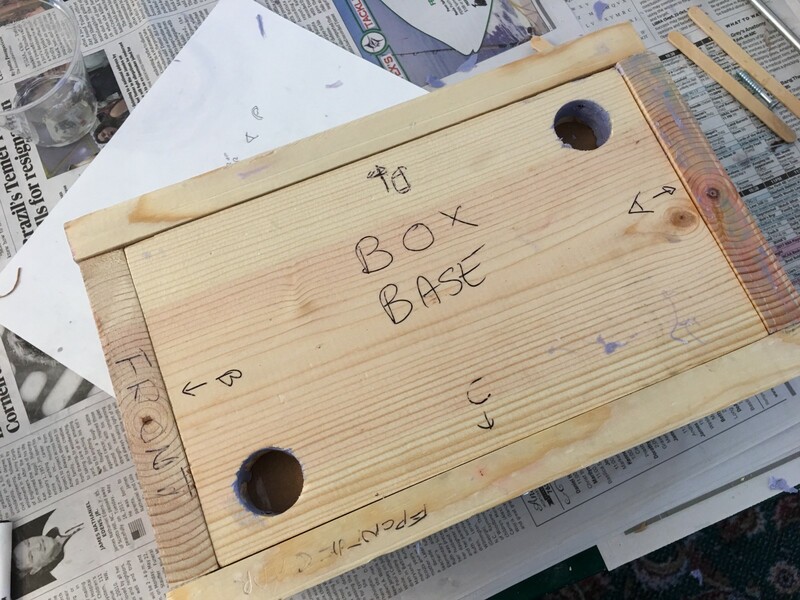 The box was reassembled with the first half of the mold in place. Everything was sprayed with mold release. 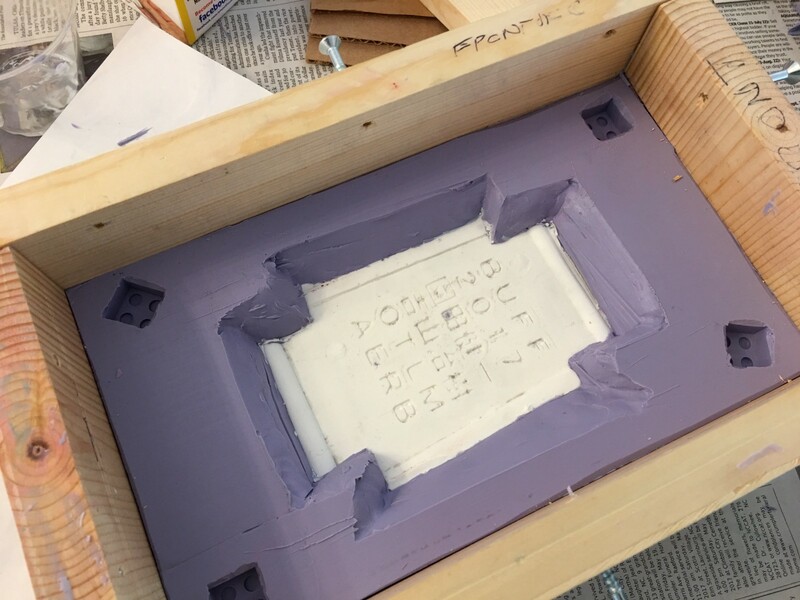 Smooth-Cast 65D was prepared and carefully poured into the mold. The pot life of 65D is 2½ minutes, so I had to move fast. 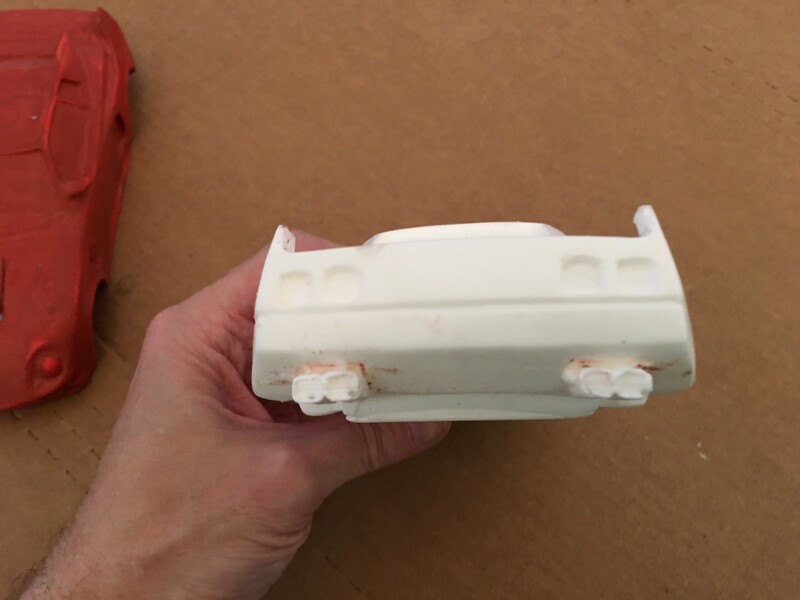 I swished it around a little to make sure it got into all the small areas, like the side view mirrors, then added the second part of the mold and the cardboard, and locked the base in place with screws. Elapsed time: 1:45! Whew! I figured out a cute way to estimate the amount of resin I would need. 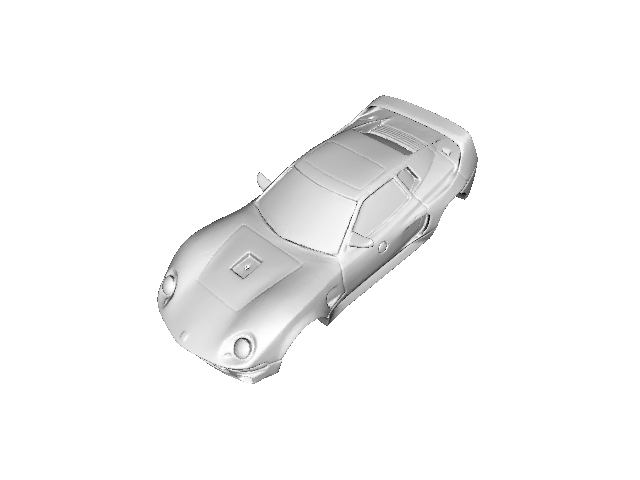 One of the things NetFabb will tell you is the surface area of a model. 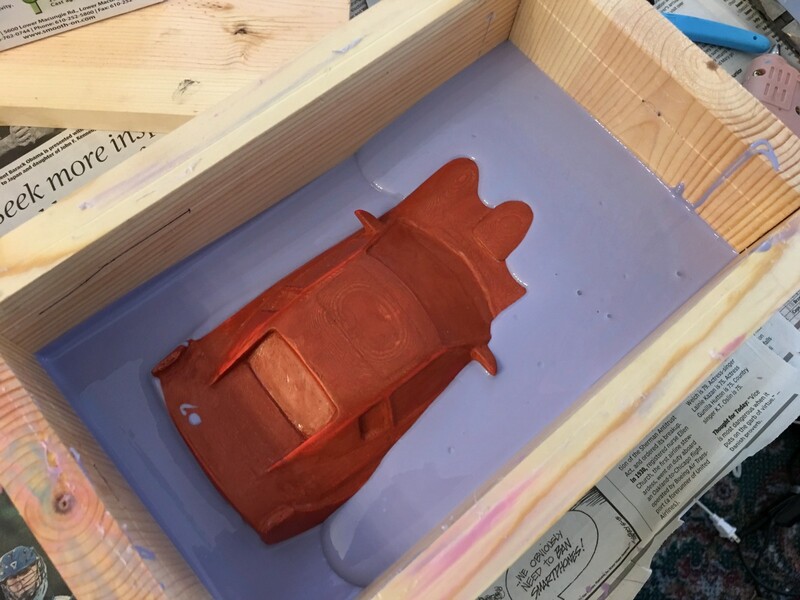 I used the surface area of the body shell (which has an inside, so it’s roughly twice the surface area of the outside) as a rough estimate of the total surface area of the body + chassis: 1281 cm². I multiplied this by the desired thickness (2mm) to get the volume of resin needed: 256 cm³. The resin weighs 1.05 g/cm³, so I needed 269 g of resin. 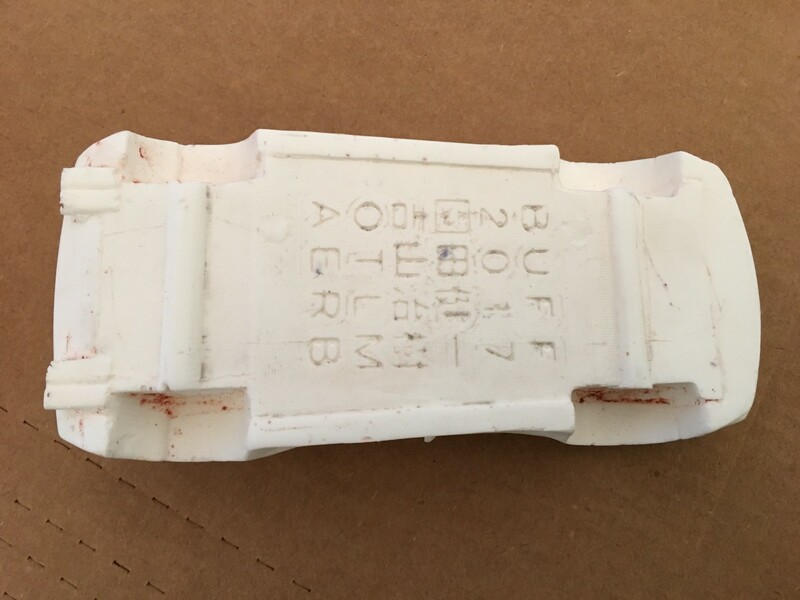 The two resin parts are mixed in a ratio of 100:93 by weight, so I needed 139.4 gm of Part A and 129.6 gm of Part B. After the casting was done I drilled a hole in the base to test the thickness: 1.67mm. Close enough. …pretty good. There was a minor imperfection in the grille and one of the tailpipes, but those should be easy to fix. 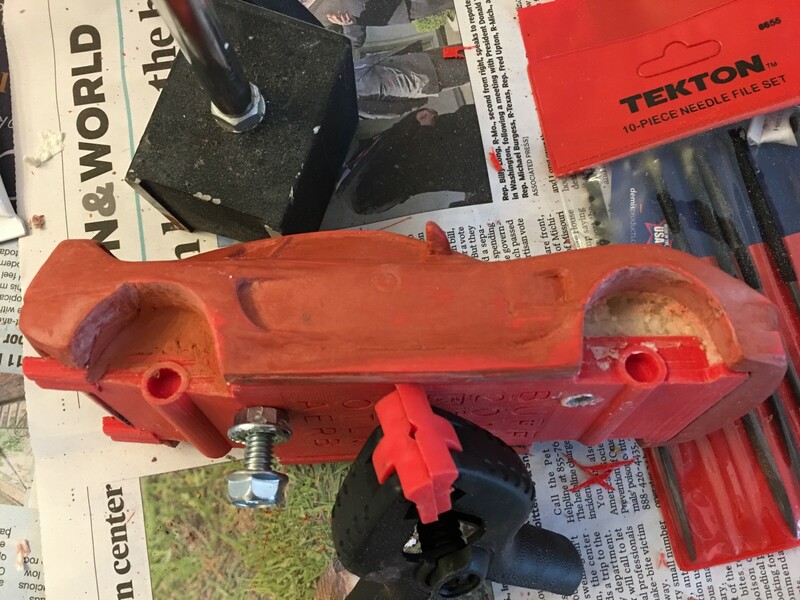 There was also a minor problem on the axle where I had to do the surgery, which I believe was caused by movement of the the flap I had to create. 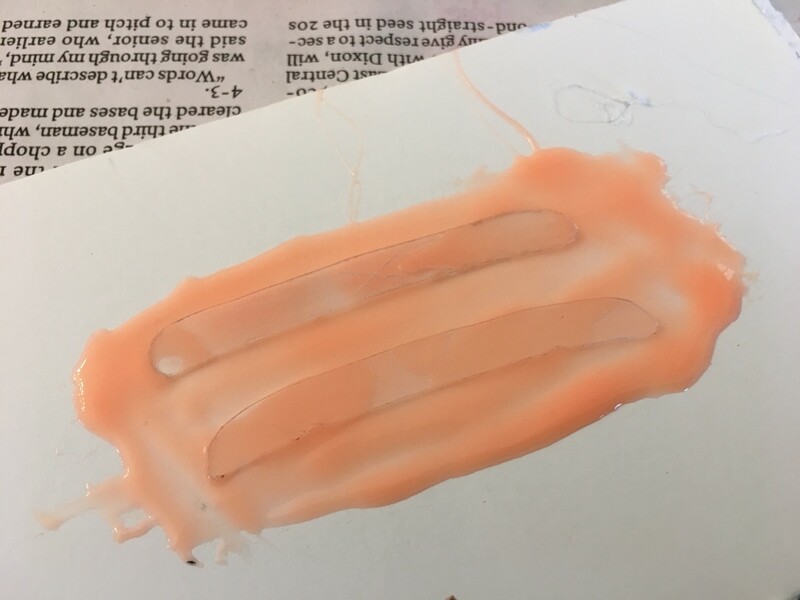 I did a quick experiment and found that viscous superglue can be used as a temporary silicone adhesive, so I am going to try and use that to lock down the flap in future casting attempts. In the upcoming Part II, I’ll cast the wheels. These will be pretty simple, but I didn’t want to do them until I was sure I could do the body because they have a lot of fine detail, so I’m going to get the models printed at a higher resolution than my printer can achieve. No sense paying for that until I was sure I would need them. The saga continues in Part II, and remember to 💚 this article if you enjoyed it.